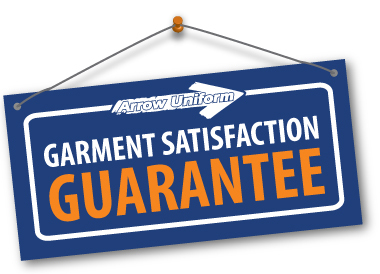 Every garment from arrow Uniform is guaranteed to meet your satisfaction. If for any reason you are not satisfied with your order, return it within 30 days and we will issue you a refund. Although we are sorry to hear that you have had some troubles with your purchases, at Arrow Uniform, we are here to help. Thankfully, our return and exchange process is as simple as 1-2-3! Just simply follow the steps below and you will be taken care of in no time! At Arrow Uniform, we deliver your total image. Guaranteed. Fill out the Return Authorization form in its entirety and then call, fax or email it to our customer service department. Arrow will return this form to you with your RA number by either fax or email. Write the RA number on the outside of the carton. Returns sent without an RA number on the carton will be returned to sender. Your refund will be in the form of original payment. 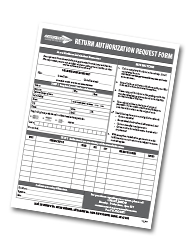 Click here to download our Return Authorization form! Looking for a Replacement Item? Do you have modified or custom items? Personalized, custom modified and/or custom manufactured garments, or standard garments that have been worn, laundered or dry cleaned are non-returnable unless defective. All other garments are subject to a 20% restocking fee.